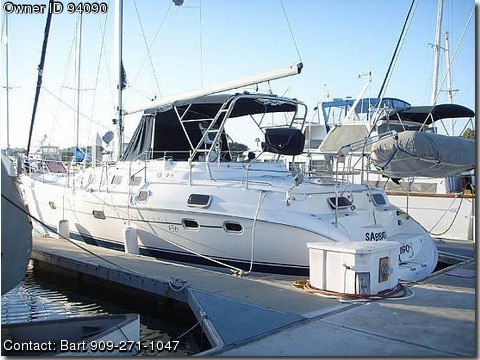 Call Boat Owner Bart 909-271-1047 909-503-2510. Why buy new when the current 45cc is 2 ft shorter and with these upgrades would cost you 100000 plus dollars more . This is a better than new with 50 engine hours 456. Comfort and spaciousness are the hallmarks of a center cockpit cruiser sistership to the 466. Hunter has concentrated on adding real performance and making the 456 easy to sail. The difference lies in the initial design. A modern underbody provides the performance while the innovative deck plan offers safe and easy sail handling, even when short-handed. The cockpit is wide and deep and just right for those long passages. A tall BR rig gives you the power in the mainsail, which is much easier to tame than a monster genoa, and the in-mast furling system adds to the ease. A specially designed Whitlock gear steering system gives you the smooth control you desire with just the proper amount of feedback you need. The composite rudder and post are corrosion free and stronger than conventional gear. Hunter has gone the extra step in ensuring your comfort and safety at sea. Construction methods are second to none and include the finest in materials such as UV-resistant gelcoats, Kevlar hull reinforcements, real lead keels and through bolting on the hull to deck joint. Bulkheads and chain-plates are bonded directly to the hull and the loads are spread evenly throughout. Come aboard and Discover the Difference Magnificent owner's stateroom aft with ensuite head and stall shower. Guest stateroom forward with pullman bed and ensuite head and shower. Leather interior, fully equipped u-shaped galley, forward facing navigation station Queen size bed in master stateroom with 7" thick innerspring mattress. 6'5" Headroom, Corian countertops, Corian Spice Rack. Double Stainless Sinks with Cutting Board. LPG 3 Burner Gimballed Stove with Oven and Microwave Top and Front Loading Refrigerator with Separate Freezer - Both Lighted. Electronics: Raymarine Pathfinder RC 530 color radar and chartplotter at helm. Raymarine E-120 color radar and chartplotter at helm. Repeater at nav station and Master stateroom. Raymarine 7000 autopilot, Raymarine Digital Knotmeter with Log. Raymarine Digital Depthsounder with Alarm. 42" LCD flat screen-salon.15" LCD Salon. 23" LCD Flat screen Master Stateroom. Kohler 8KW Gen set Alternator ugrade-105 amp Built-In Solar Panel on Sea Hood. Secondary Rule 4000 high water bilge pump, 50 Gallon Waste Capacity Macerator Pump, 200 Gallon Capacity HotCold Pressure Water System. Tank Gauges For Fuel, Water and Waste. Sheet Winches Cockpit bimini and dodger Dual Offset. Hot Cold Pressure Transom Shower. 2 Large Transom Lockers. Port Starboard Aft Sundeck Cushions. Split Anchor Well for Rode and Chain. Stainless Steel Arch with Mainsheet traveler. 11' inflatable dinghy with Davits. Mercury with 15 hp outboard with hoist. Outboard motor rail mounted bracket. 40" leather covered folding wheel.